Here is a little picture postcard claimed to be from 1906 featuring the Actress Gladys Constance Cooper. Take a look at the family photograph - a young lady, two children, a pug and a deerhound lounging around the sofa. 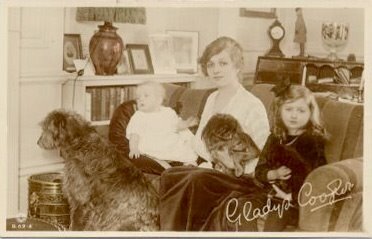 Gladys was born in London on the 18th December, 1888.If the young lady is Gladys, this would make her approximately 17 years old in this postcard, a time when she began her acting career. Or could it be that the young child in the image is Gladys? More importantly, who is the extremely good looking hound with back to the camera and a typical deerhound sense of importance? I can’t tell you about the deerhound but here is a little information about Gladys Cooper for the interested. By the outbreak of World War I Gladys had grown into a stunningly attractive young woman and was a favourite pin-up for the British forces. In her early life she pursued a career on the stage and eventually film and appeared in several movies in Britian, even playing the part of ‘Flora MacDonald’ in the ‘Bonnie Prince Charlie’ movie of 1923. In 1934 she travelled to America and this led to her discovery by the Hollywood moguls when her movie career really took off. Her first hollywood role was in "Rebecca", with Laurence Olivier and Joan Fontaine. By 1942 she earned an Oscar nomination for Best Supporting Actress Oscar for her role in 'Now, Voyager' (as Mrs. Henry Windle Vale, mother of co-star Bette Davis' character), and again the following year for her part (Sister Marie Therese Vauzous) in 'The Song of Bernadette'. During her time in Hollywood she appeared in over 30 movies, often reprising the role of the dignified aristocratic lady. This explains her choice of Dog perhaps, although her father was a Journalist and may have been taken by all the Victorian Romanticism, the fashion of the day. Other notable movie credits for Gladys include 'Madame Bovary' in 1949, and 'My Fair Lady' in 1964 (as Mrs. Higgins - her third oscar nomination). In 'My Fair Lady', The painting above the mantel in Professor Higgins' study is a portrait of the young Gladys Cooper. I always think it of interest to read about the owners of Deerhounds and outside of the breeding circles - many seem to be an arty bunch. 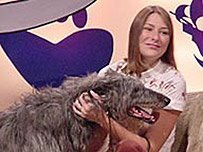 Below is a list of Gladys, celebrity companion to deerhound’s movie career - enjoy! It’s always a cop out for all humans who keep a blog or webspace and just cut and paste other web page articles. 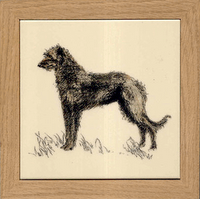 But I’m a Deerhound as you will know if you’ve visited this blog before, and I just like to include all deerhound objects, arts, links and articles of interest for other deerhounds and there human companions or fans to enjoy. Florian Tile of Dorset, England, has been producing high quality hand-decorated ceramic wall tiles since the 1960's. They offer over 100 different dog breeds. Florian is a family run business specializing in producing unusual and imaginative designs on tiles. The designs are produced by well known and local artists. These tiles are mainly wall tiles for kitchens and bathrooms and can also be made into gift items such as trivets, table mats, clocks, cheese boards, pictures, or they can be displayed individually on a stand. The tiles are produced by first making a silk screen from the original artwork. 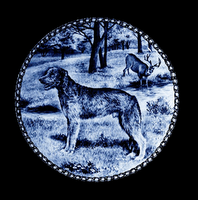 The screen is then individually hand-screen-printed onto a bisque tile and hand-painted with under glaze ceramic colors. The tile is then glazed with a transparent glaze and fired at over 1000 degrees centigrade in a kiln. This traditional method produces a rich and subtle effect of color not possible with transfers. These original artwork tiles are as functional as they are beautiful. And below I have blatantly lifted copy from the bbc, for a programme that may be of interest to fans of deerhounds - I wonder if our distant relative Bran will be mentioned. If you are in the UK check it out on TV tonite. If you can’t receive the channel visit this link. you will also find other Ossian links from here. Crime writer Alexander McCall Smith tries to unravel one of the great literary 'frauds'. In 1761, a Scot called James Macpherson published what he claimed were the works of a poet named Ossian, written more than 1,000 years ago. This caused as much fuss as the so-called Hitler Diaries more than two centuries later, and were seen as a publishing sensation of the time. But Dr Samuel Johnson repeatedly questioned the validity of the poems, and further doubts meant that Macpherson, once lauded in high circles, was classed as a fake. But was this a simple case of fraud?